But then the Yankees learned from their mistakes. They kept their prospects and won many World Series. And all was right in the Bronx. But now, these Bronx warriors seem to have forgotten history, and seem on the verge of not only repeating history, but outdoing it, by trading away one of the best prospects in recent memory. Phil Hughes, a 1st round draft pick, who dominated through the minors and pitched with the big club before the time he could drink—with accolades and talent to spare. Baseball America rated Phil Hughes the No. 4 prospect in all of baseball with these words; "As good as Chien-Ming Wang has been, this homegrown ace will be even better." Why did they say that? Well, during his time in the minors, Hughes had comparable or better numbers than Scott Kazmir, Mark Prior, Francisco Liriano and yes, Johan Santana. I'm sure you see where I'm going with this. So here it is. "Yankees. 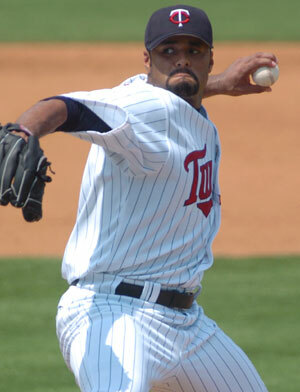 Do not trade Phil Hughes for Johan Santana." Two reasons: The first being, that Phil Hughes could be the rock-solid ace the Yankees haven't grown since Andy Petitte—and by all accounts, Hughes could be a great deal better than Andy. The second: the Santana you see the past 4 years may not be the same once he hits 30 and pitches in big games in October in Yankee Stadium. Let's do the second point first. And I start with a few names. Kevin Brown, Javier Vasquez. Randy Johnson. Guys with big arms, and big contracts. But what's the one thing that truly ties them together. Hmmmm....how about the minute their cleats hit Yankee soil, their ERAs ballooned? Don't believe me? Let's take the a few examples. Javier Vasquez, pitching in the peace and quiet of Montreal 2003—an ERA of 3.24 and 230 innings pitching. The next year, pitching in the turmoil and pressure of Yankee Stadium—an ERA of 4.91 and less than 200 innings pitched. Kevin Brown, 2003 Dodgers—ERA of 2.39 and 211 innings pitched. 2004 Yankees—4.50 ERA and 132 inning pitched. Randy Johnson, 2004 Arizona—2.60 ERA and 245 innings. 2005, Yankees—3.79 and 225 innings. The next year, 5.00 ERA and 205 innings. And this has been going on forever (which makes the Yankees lack of realizing this all the more frustrating). Let's go back a few years. Dave LaPoint, 1988 Pittsburgh Pirates and Chicago White Sox—3.25 ERA and 213 innings pitched. 1989 Yankees 5.62 ERA and 113 innings pitched. Andy Hawkins, 1988 San Diego Padres 3.35 ERA and 217 innings pitched. 1989 Yankees 4.80 ERA and 208 innings pitched. The next year, 5.37 ERA and 157 innings pitched. And my personal favorite: Steve Trout, a Chicago Cub, who had thrown two shutouts right before being traded to the Yankees, then threw 3 wild pitches in the first two innings of his debut with the Yankees, some of them hitting the backstop. His ERA with the Cubs in 1987 was 3.00. The same year with the Yankees, 6.60. I could go on (Kenny Rogers being another favorite, I won't even touch Igawa or Irabu), but you get the point. Pitching, and pitching in Yankee Stadium are two totally different things. I'm not saying Santana is guaranteed to be a washout once he's in the lights at Yankee Stadium come next October. I'm just saying it's one thing to pitch in Minneapolis, or San Diego, or Arizona, where there are swimming pools in the grandstand and people don't bleed team colors, and another animal completely facing the Red Sox in October with 57 thousand people who live and die with the Yankees, and 4 newspapers comment on every move you make. Considering the history with big Yankee pitching trades and signings, this blog has to wonder...why so quick to give up on a 21 year old, who scouts say had 4 "plus pitches." Why try to buy a World Series when history has more than proven it doesn't work? And especially why give up on youth when the 4 World Series in 5 year run was built on Pettite, Rivera, Williams, Jeter and Posada, all guys built from your farm system? 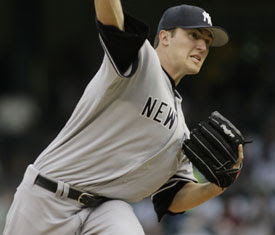 Just like I can't say Santana will blow once he's a Yankee, I can't say Hughes is going to be the next Sandy Koufax. However, I can say that Yankee pitchers that come from the farm, rather than come in from big-time trades, have proven far more worthy. History tells us that. Let's listen to it this time. Some good points, especially about Kevin Brown. Always be wary of anybody coming out of the humongous Dodger Stadium . It is a pitcher's paradise. The Yankees are never going to get Santana for Hughes, Melkey, and a "mid-level prospect" as it has been reported, and they shouldn't. Its not enough. Hughes??? Minor league stats are minor leagues stats and potential means nothing unless you deliver in the pros. Melkey??? I know everybody loves him, but he is a 3rd or 4th outfielder. Santana is in his prime (and a lefty!) and can't be compared to Brown and Johnson who were both on the definite back end of their careers. The Yankees would be lucky if they were able to land Santana for what they are offering. The only reason the Yankees kept their young players that formed the nucleus of their championship teams is because Steinbrenner was barred from the day to day operations of the team in the early 90s and couldn't trade everyone away. "The only reason the Yankees kept their young players that formed the nucleus of their championship teams is because Steinbrenner was barred from the day to day operations of the team in the early 90s and couldn't trade everyone away." Very much agree to this. He would have traded Jeter, Bernie, Mariano (who wasn't thought of as highly as we might assume) and Andy in a heartbeat. If Santana wasn't left handed I don't think that it would be a tough decision to avoid dealing Hughes and other prospects for him. However, he is the best left handed pitcher in baseball, and left handed starters are valuable commodities - especially when half the pitcher's starts would be in Yankee Stadium. Still, I think they would be giving away too much to land Santana.